After The Green Withered by Kristin Ward is the first book in the book tours organised by @The_WriteReads. 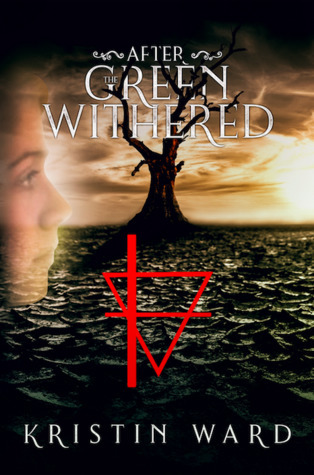 After The Green Withered has won an award for Best Indie Book in 2018, so my expectations were high. But from the start I had a hard time getting into this book and only became worse. I was offered a copy of the book in exchange for an honest review. Oh boy, will I be honest. My biggest problem with this book is the world building. In the first few pages, the Netherlands flooded as a result of climate change. Should sea level rise, we’re the first to go. Apparently. I live 4,5 meters below sea level. I live in an area that’s been reclaimed from the sea. But I’m not afraid of getting wet feet when sea levels rise. It’s highly unlikely that will happen if the polar cap melts at the rates predicted. The only scenario I can think where my house will be flooded is when a tsunami hits. When sea levels rise, the area I live in won’t be the first one to flood. Not even when I live 4,5 meter below current sea levels. Why? Because the Dutch have engineers that are experts on fighting water, protecting their land from water, and use it purposefully. When New Orleans was flooded after hurricane Katrina, we were the first to be called to protect the city from future disasters. Killing us, as a nation, off in the first few pages feels unreal. Having a US organisation take over the world with their water regulation ideas, would only be possible with substantial funding and nepotism. I can’t honestly think of a scenario where that would be possible without Dutch engineers. Is it harsh to be so critical? Maybe, but I promised an honest review. Here it is. I can’t believe in the world Kristin has created. It feels to me like the research done is inadequate and many things were made up along the way to fix a plot filled with holes. How come the school system is still the same after over a hundred years? Why are the first people we meet all against the regime of the DMC? That means the propaganda isn’t working as it should. It’s not like in The Hunger Games where each district could have their own community within the walls. The power of the DMC is stricter. They control more aspects of the citizens’ lives. The story itself reminds me of other YA dystopian stories like The Hunger Games and Divergent. It’s the kind of story I would’ve swallowed whole when I was a teen. The internal struggle of Enora is the main focus as she discovers what the Company is really about. My problems with world building got in my way of enjoying it. I couldn’t help but to question it thrice (what, how and why) every time something new was introduced. I still found a few inconsistencies (Drake’s siblings) and have many questions (pineapples?). I know that I won’t get answers to most of these, and Kristin doesn’t owe me anything. The writing was okay. It didn’t stand out to me like high quality writing I’ve seen in other indie books. The style is straightforward, practical, and uses what’s necessary to tell the story. I took awhile before noticing it was written in present tense, not something I read often. It worked well for the story and it didn’t bother me as much as I thought it would. Now it’s up to me. Will I read the second book or no? I haven’t decided yet. I liked the story, but the world building (one element in stories I value highly) is getting to me. I rate After The Green Withered 2,5 stars. It would’ve been higher if I didn’t live here and had the knowledge I do. I also had some issues with a few things (yep, the sibling thing), but for the most part I just let it flow. I can understand your view though. I know nothing about flood water management/engineers/etc, but if I did I think it would bug me. Great review!